WHEREAS, it is vital that the Commonwealth of Pennsylvania create and implement a scientifically-sound, thoughtful, holistic and proactive approach to addressing this emerging contaminant. Functions of the PFAS Action Team. Ensure drinking water is safe. Identify impacted locations and resources and create and implement an action plan to assist state and local authorities and public water systems in delivering safe drinking water. Manage environmental PFAS contamination. Develop and implement environmental response protocols for all positively identified sites. Develop specialized site plans, engaging the public and other relevant stakeholders, where appropriate. Reduce risks to drinking water and the environment from firefighting foam and other sources of PFAS. Identify PFAS uses that are most likely to pose a risk to human health and the environment, such as the use of firefighting foam, industrial releases, carpets, food packaging materials, and other uses. Develop recommendations and actions that can be taken to limit or control these and other sources of PFAS. Develop a clearinghouse of information on PFAS. Establish a public information site and protocol to effectively inform and educate the public about PFAS. Establish a standard process for sharing pertinent information between all members of the Task Force. Explore avenues of funding for remediation efforts. Engage with academic institutions and experts in the fields such as public health and environmental remediation, among others, when necessary. Composition of the PFAS Action Team. The Secretary of the Department of Labor and Industry, the Executive Director of the Fish and Boat Commission, and the Chairperson of the Public Utility Commission may participate in the functions of the PFAS Action Team as requested by the chair. Each agency Secretary, Executive Director, and Chairperson on the PFAS Action Team may designate an appropriate member of their staff to participate on their behalf. Effective Date. 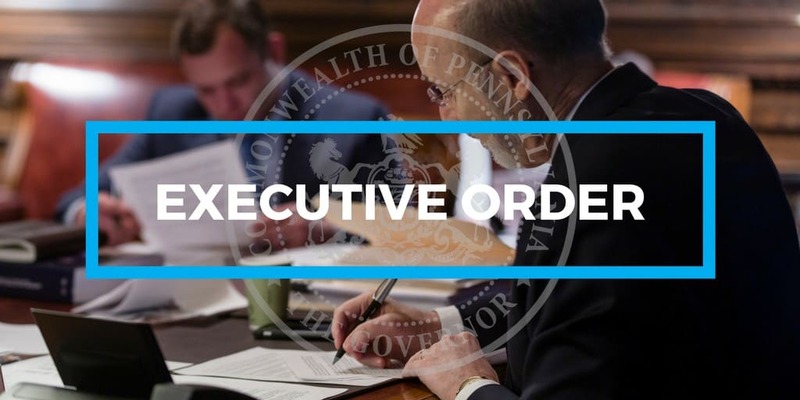 This Executive Order shall take effect immediately and shall remain in effect until amended or rescinded by the Governor.